Okay so let's rip off the bandaid and get some of the eye-wateringly pricey calendars out of the way first. 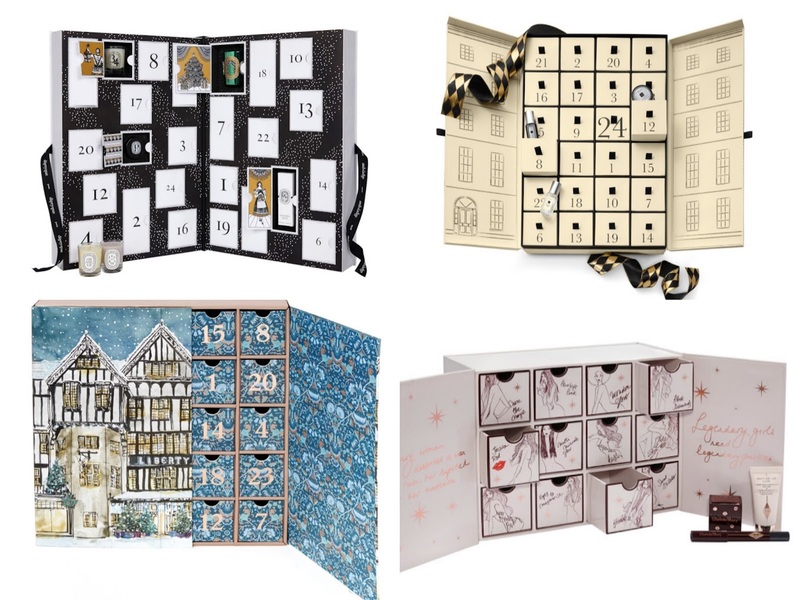 Not the easiest on the pocket, but definitely some of the most luxe and lustworthy calendars around, include the Diptyque and Jo Malone selections - sadly I won't be buying either of these, but if I could afford to drop £250 and £280 respectively on an advent calendar, believe me I'd be first in the queue for these beauties. 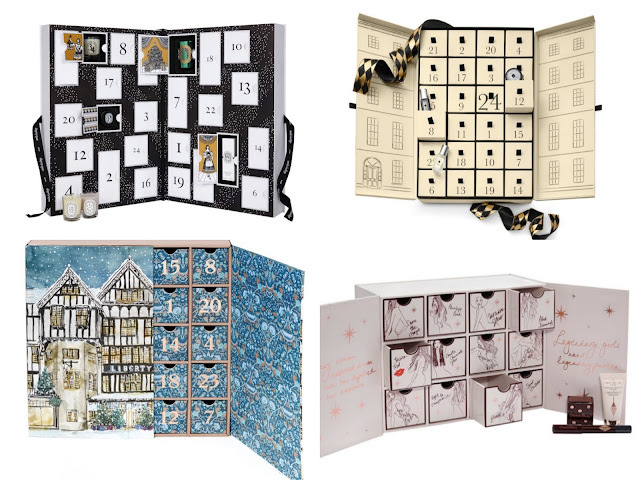 The Liberty calendar is a firm fixture every Christmas, and I love the beautiful packaging which you could re-use to store jewellery or other small bits and bobs. You get all the big name brands inside this one too. 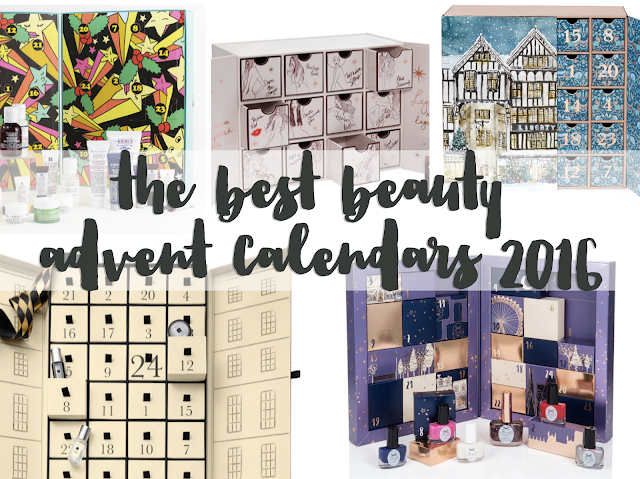 Charlotte Tilbury's calendar has a similar drawer style and looks beautiful this year - you only get 12 products, but they're all quite generous sizes. I was so tempted by this one last year, but it contained some products and shades I wouldn't use, so I decided my £150 would be better spent selecting full size products. I'm reserving my verdict this year until I've inspected the full contents. I'm pretty sure that these calendars are a first this year for both Molton Brown and Khiel's and I'm very interested in both. The Kiehl's calendar is bursting with amazing skincare in deluxe sample sizes which is of course a great way to try lots of things from their range before committing to a full bottle or jar. 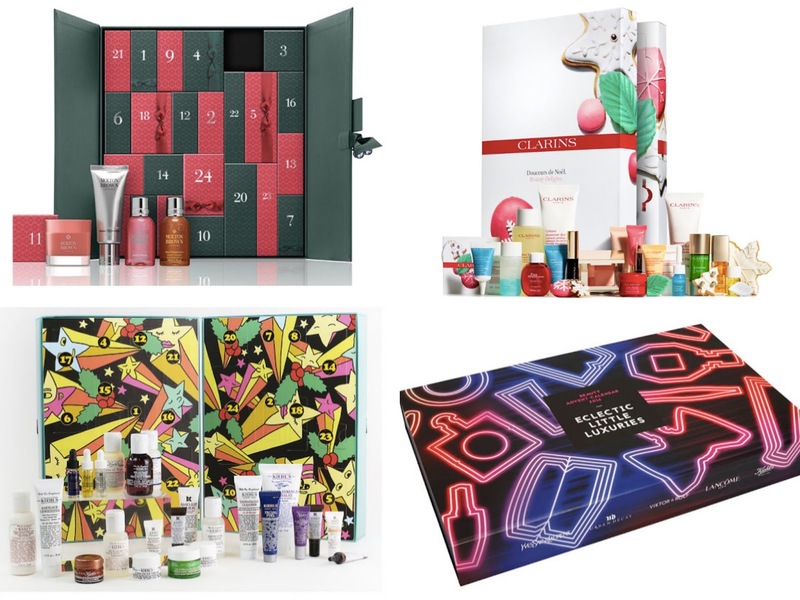 Clarins also have a grand skincare selection for the same price, and as usual Selfridges have a big brands calendar which is sure to sell out fast as always. Another new on the scene calendar is this one from ASOS. 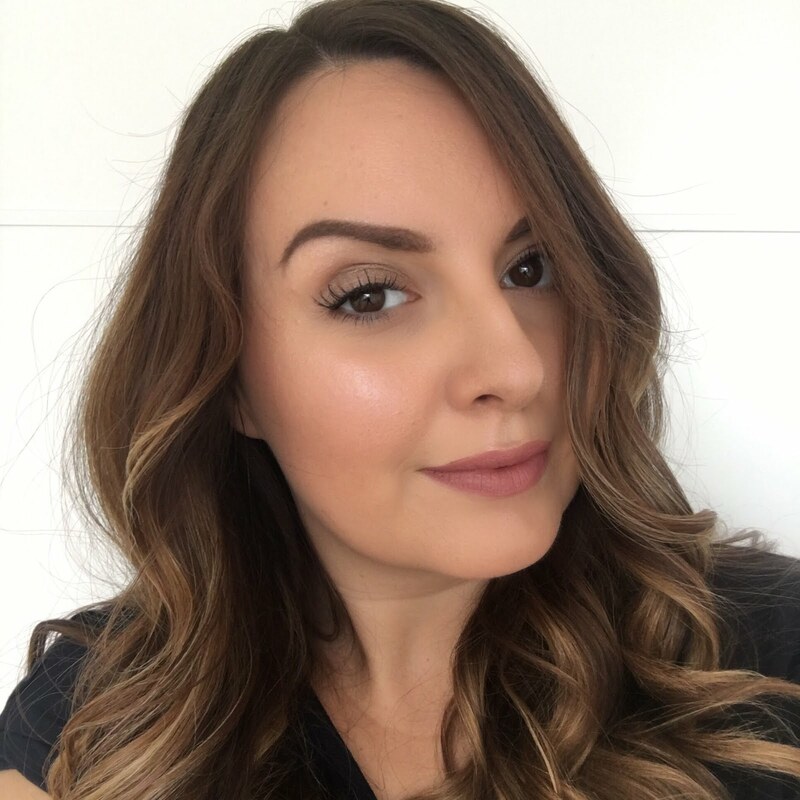 It contains a wide mix of the beauty brands that they sell - it leans more towards the practical rather than luxury side in my opinion as it contains things like dry shampoo and face wipes, but it's a very good deal as you're getting £175 worth of product for £50! Boots No7 are releasing a new version of their ever popular calendar which is perfect for fans for their skincare and makeup, and Rituals and joining in on the fun with a very well priced calendar containing the perfect introduction to their skincare and body products. The Tanya Burr calendar almost didn't make it to the list as it does only have 12 doors, but I have a real soft spot for Tanya and this is a very cute calendar for teens getting into makeup (and I wouldn't say no either!). 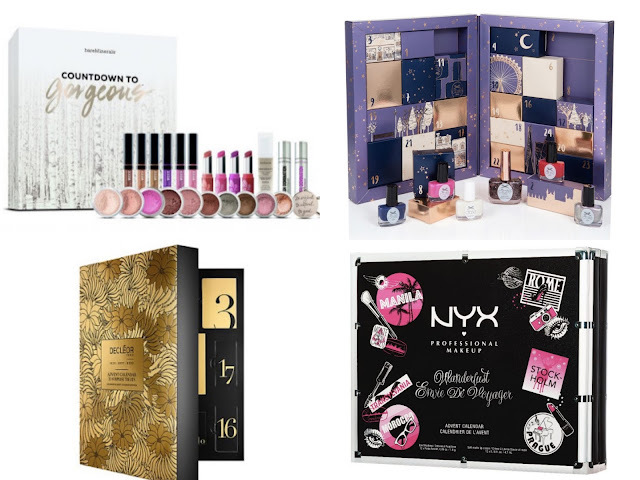 I'm a makeup junkie first and foremost, so the advent calendars from Bare Minerals and NYX are some of the most exciting to me. The NYX in particular is top of my wishlist and is expected to contain 12 soft matte lip creams in a mini size and 12 eyeshadows. The Decleor calendar doesn't appeal to me personally, but I included it because it would be my Mum's favourite and also because I think it's very well priced at £60 - you get 24 products including two full sizes, so I expected a much higher price point. I've had a Ciaté advent calendar for three years in a row now, and I think I'll be making it four as this year's calendar looks so stunning in its purple and rose gold packaging and the polish colours do change ever year - I haven't had a dupe yet! L'Occitane had a fabulous advent calendar last year which kept me stocked in luxury bathing travel minis for all of my trips in 2016, and this year's version looks bigger and better with even more products. Look Fantastic have a new version of their advent calendar this year - the contents seem to be a secret for now (hence the name?) but this is sure to contain their top beauty and haircare brands. Marks and Spencer again this year have what I think is one of the best advent calendar deals - it's just £35 when you spend £35 in M&S, which is very easily done at Christmas, right? I missed out on this one last year as I wasn't quick enough off the mark, so must harder this time! The Body Shop have not one but three advent calendars available at different price points, which just shows how popular their calendars are. And lastly, one of my favourites just because it's a little more unusual, are these two options from Bomb Cosmetics - you get 12 bath bombs and 12 soaps in each calendar - so cute and dinky! So there you have it, not every calendar, but the ones I think are worth checking out. Benefit have a calendar this year, but personally I don't love the packaging and I don't think it's anywhere near as exciting as their previous efforts. Liz Earle has a calendar with eight doors, which to me is a selection box not an advent calendar! Superdrug have several advent calendar options for teens as well as one from Makeup Revolution, so worth checking those out. Boots also have a few others including Jack Wills and Sanctuary Spa. 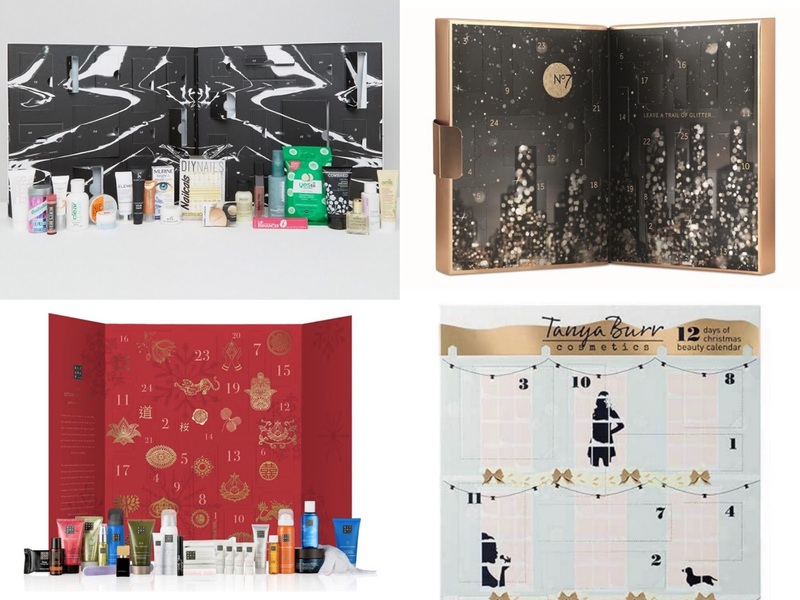 Sainsbury's are getting involved with a Dirty Works calendar option, and even Aldi have a skincare advent calendar - we're truly spoiled for choice this year, and that's before I even consider* a chocolate advent calendar! 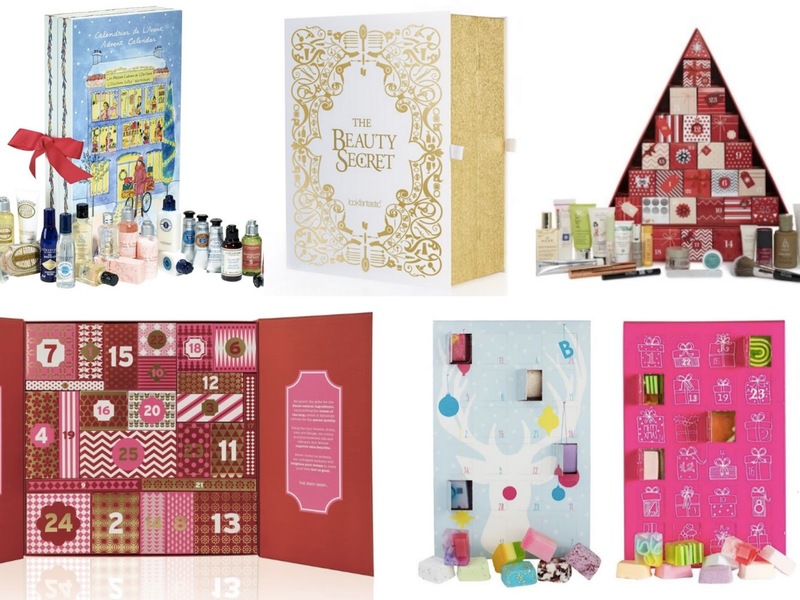 Will you be opening the doors on a beauty advent calendar this year? Let me know which one! *Who am I kidding - there's no consideration needed, I've had a chocolate advent calendar every year of my life and have no plans to stop now!